(September 29, 2010) --- The PackerPage has recently uncovered information revealing that Green Bay Packers linebacker Clay Matthews has been the subject of voluntary mind-control in an effort to better his hit-man performance on the football field. Matthews --- who had 10 quarterback-sacks last season as a rookie --- racked up an impressive six sacks in just his first two games this season. The Packers attribute Matthews' improved "seek and destroy" abilities this year to the addition of a new "coaching" position which Green Bay covertly established last July. 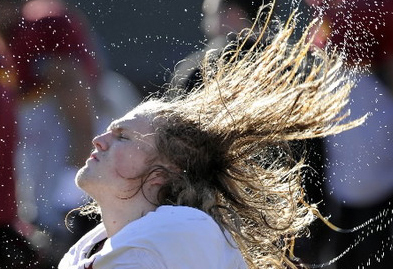 Here’s a nice photo of Green Bay linebacker Clay Matthews shortly before undergoing his weekly indoctrination. Clay usually books his brainwashing just after his weekly appointment with his personal stylist to get his hair straightened and split-ends clipped. Packers Defensive Thought-Reform Trainer Yen Lo, a former Chinese/Korean doctor-spylord, first introduced the cutting-edge psychology to the Packers with the goal of developing a more concentrated, intense defensive line through a special kind of hypnosis. 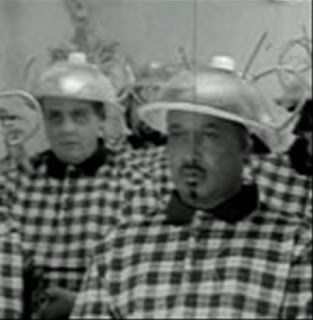 Matthews was the first on the team to volunteer for the controversial procedure. 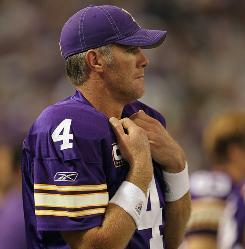 The process centers around the leagues loathing toward Minnesota Vikings’ quarterback Brett Favre. Yen trained Matthews to transfer and harness that feeling of animosity and focus it toward whomever the quarterback happens to be on the opposing team. Packers’ linebacker Clay Matthews embarked on a special training program this season. Part of the regimen involves martial arts along with a certain proto-psychic hypnosis. Specifically, any opposing quarterback will be subconsciously substituted for a foe of special emphasis... such as a certain flip-flopping, over-the-hill, interception-prone, gray-haired Minnesota Viking grandpa. Sitting in a movie theater chair with a bag of buttered popcorn, a giant box of Milk Duds and his eyelids propped open, Yen flashes a series of images in front of Matthews while recording his reactions. Using his thinking patterns, Matthews is then presented with a number of photographs of the quarterback he will be facing in the next Packers game. Then through a barrage of split-second images, jolts of electricity and a seemingly endless loop of Wrangler Jeans commercials, Matthews is brainwashed into thinking the next QB he will face will instead be Brett Favre. It is common knowledge that Illinois authorities have been utilizing a brain-draining process called “Thought Stopping” on its citizens since the days of George Halas as a way to demand unquestioning devotion, loyalty and submission to that evil cult known as the Chicago Bears. Here’s a nice vintage photograph of a few FIB’s having their sense of self systematically destroyed before robotically marching into Soldier Field to “support” their team. (September 6, 2010) --- Although the Green Bay Packers remain a profitable team, they’re just not bringing in the green and gold for the Green & Gold as much as they used to. Team officials announced that the Green Bay Packers posted an operating profit of $9.8 million in the fiscal year that ended last March, down from $20.1 million the previous year. According to Packers president and CEO Mark Murphy, the drop in profits has been attributed primarily on escalating player costs. “And to get us back solidly in the black, a few cost-cutting/money making measures had to be taken... other than once again jacking up the price of your Miller Lite at Lambeau." The Packers were the first team in the league to fly to away games when they pioneered the practice in 1940. 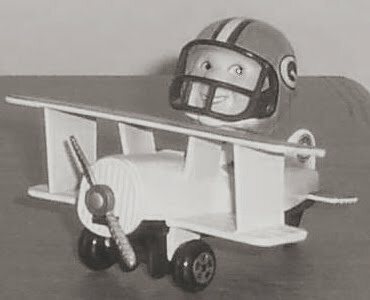 Here’s a nice vintage photo of Packers tailback Cecil Isbell smiling as he departs Green Bay for a game in New York against the Giants. 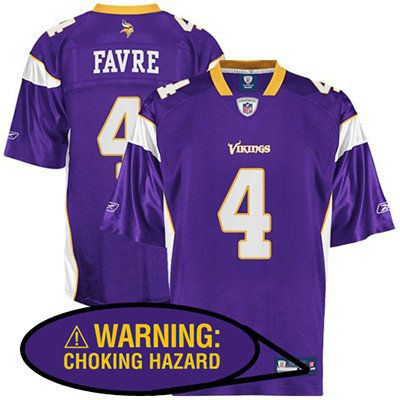 Leave it to the Packers to once again break new ground and lead the way in the NFL in transportation. 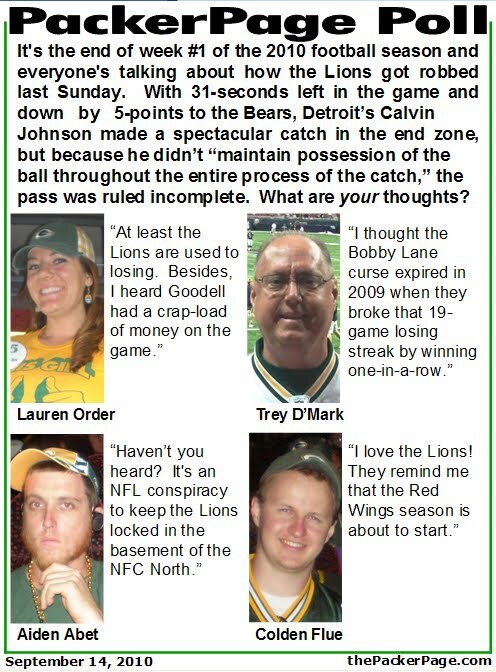 Beginning this week, the Packers squad will be saving the publicly-owned NFL franchise a crap-load of cash by having everyone on the team peddle to all of their away games this year. And by riding bicycles instead of boarding a jet, the team will be conveying a valuable environmental example to fans and other teams as well. Due to the economy and the price of fuel, the Packers have become the first team in the NFL to go all “Lance Armstrong.” Here’s a nice picture of fans outside of Lambeau Field wishing Matt Flynn “Good luck against the Eagles” as he begins his 940 mile bicycle trek to Lincoln Financial Field in Philadelphia. 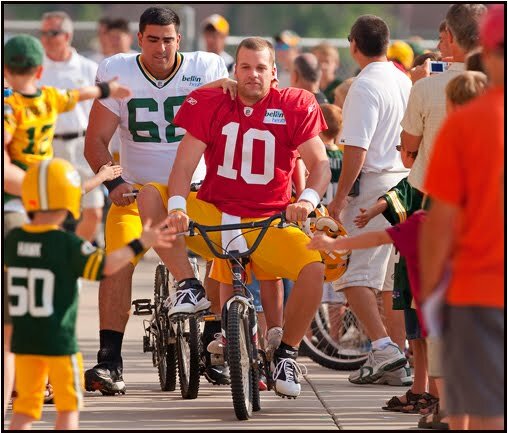 The idea stemmed from training camp and a tradition that has been in place since 1957 when young Packers fans have their favorite players ride their bikes to the practice field from the locker room. Philadelphia or Bust! Packers’ punter Tim Masthay, tackle T.J. Lang, kicker Mason Crosby and wide receiver Donald Driver know that it’s not about where you’re going, it’s how you get there. 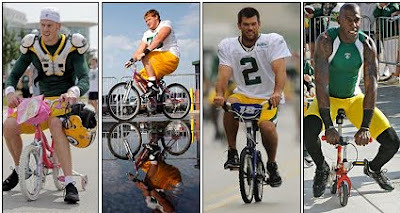 Just about everyone from the Packers’ front office will be joining the team and peddling to Green Bay’s first game in Pennsylvania this week... everyone, that is, except for the team’s senior financial account manager Traci Nygaard who can’t ride a bike any more. Apparently she lost her balance.